In recognition of UCCE Sutter-Yuba's centennial, Janine Hasey, center, was presented a Senate/Assembly Resolution by Laura Nicholson, senior district representative for state Senator Jim Nielsen, and Joe Brennan, who represented Assemblymember James Gallagher. 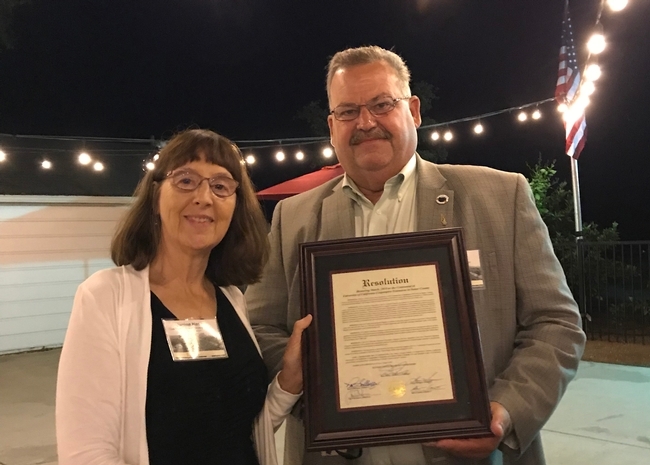 UC Cooperative Extension in Sutter and Yuba counties is celebrating a century of serving its community. “Earlier this year, we unexpectedly found two boxes full of our historical records,” said Janine Hasey, director of UCCE Sutter‐Yuba counties. “In those boxes were original reports and photos from 1918 through 1959 for both Sutter and Yuba counties.” The counties merged into one UCCE office in 1974 located in Yuba City. Jessica Hougen, Sutter County museum director, poses with drawers full of historical documents and information she summarized. 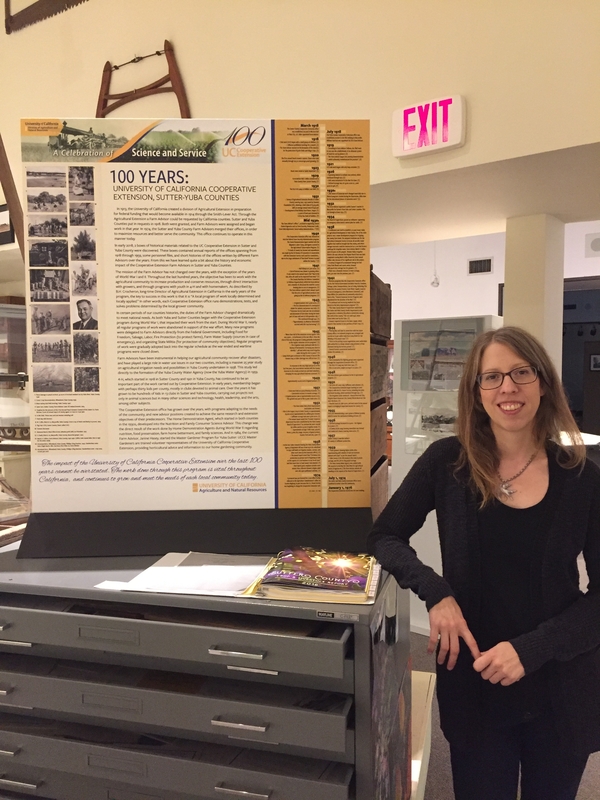 Jessica Hougen, director of the Community Memorial Museum of Sutter County, collated the historical information and created an exhibit that debuted at Sutter-Yuba's 100th anniversary event and is now on display at the museum through mid-December 2018 in the ag section. With Hougen's assistance, the UCCE Sutter-Yuba staff wrote articles highlighting UCCE's contributions to the local agriculture industry, which Agricultural Commissioners Lisa Herbert of Sutter County and Steve Scheer of Yuba County published in their annual crop reports. Beginning on page 15, the 2017 Yuba County Crop Report outlines the history of UCCE in the county, starting with the hiring of William Harrison as Yuba County's first UCCE farm advisor on July 1, 1918, then listing a timeline of contributions that resulted in economic benefit to farmers and reduced impacts on the environment. The first two pages of the 2017 Sutter County Crop and Livestock Report list major contributions of UCCE to the county over the past 100 years, with a sidebar focusing on rice. “Our partnership goes back to our first farm advisors, who were housed in the same buildings with the ag commissioners in each county,” Hasey said. Sutter County Supervisor Mat Conant, right, presented Hasey with a resolution. UCCE Sutter-Yuba staff invited elected and appointed officials, 4-H and Master Gardener volunteers, farmers, former UCCE employees, UCCE specialists and UC faculty collaborators, commodity board members and others to celebrate the local UCCE centennial Aug. 24 at John Heier Historic Howard House at the foot of the Sutter Buttes. 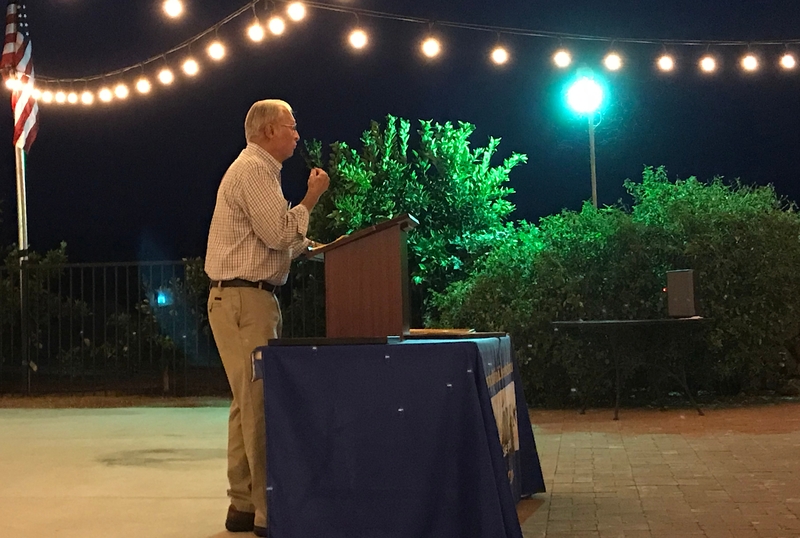 After dinner, the guests were given an overview of UCCE history by Chris Greer, UCCE area IPM advisor and former UCCE Sutter‐Yuba director and former ANR vice provost of Cooperative Extension. David Ramos, UCCE specialist emeritus and former California Walnut Board research director, who started his UC career as an extension assistant in Sutter County in 1959, provided his perspective on UCCE for the past 60 years. Andy Vasquez, Jr., chair of the Yuba County Board of Supervisors, and Supervisor Randy Fletcher, presented Hasey with a proclamation. 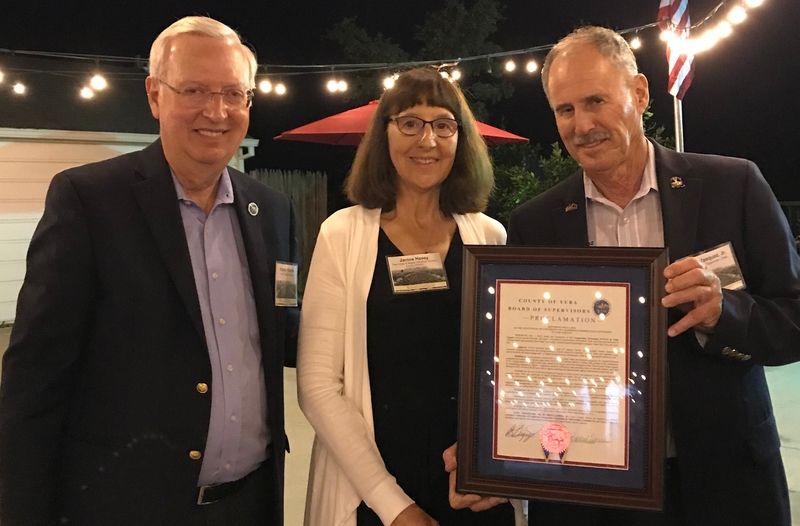 During the event, Hasey was presented a Senate/Assembly Resolution for UCCE Sutter-Yuba by Laura Nicholson, senior district representative for state Senator Jim Nielsen, and Joe Brennan, who represented Assemblymember James Gallagher. Sutter County Supervisor Mat Conant presented Hasey with a resolution on behalf of Sutter County and Andy Vasquez, Jr., chair of the Yuba County Board of Supervisors, and Supervisor Randy Fletcher, presented a Yuba County Proclamation. 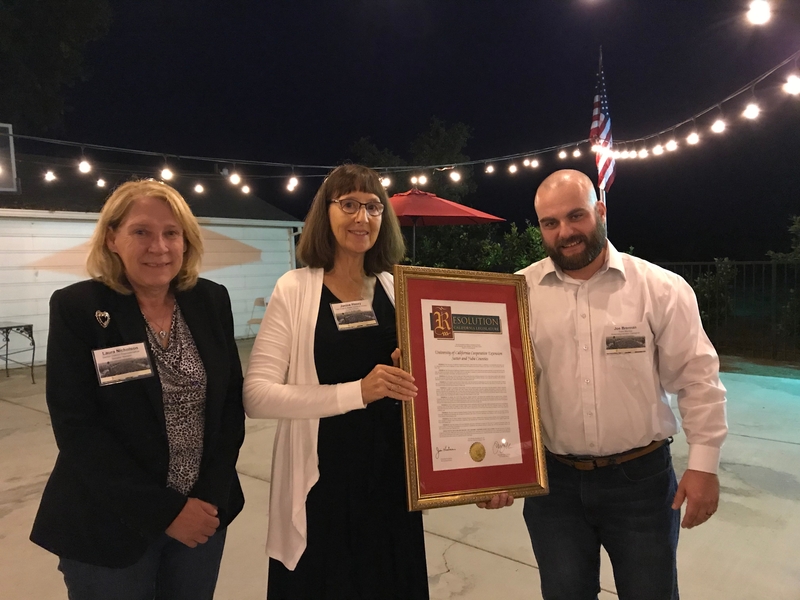 The Marysville Appeal-Democrat's Chris Kaufman interviewed Hasey, Ramos and local 4-H leader Nancy Perkins for an article about UCCE published Sept. 30. 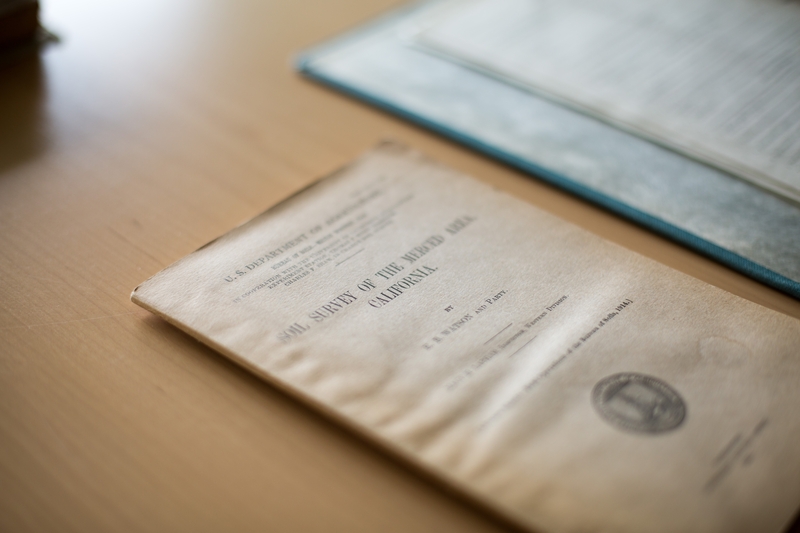 An ongoing effort to collect, digitally preserve and share 100 years of historical records by the UC Cooperative Extension (UCCE) has earned the UC Merced Library a more than $300,000 grant. The work is especially relevant to the San Joaquin Valley, said Emily Lin, the UC Merced Library's Head of Digital Curation and Scholarship. 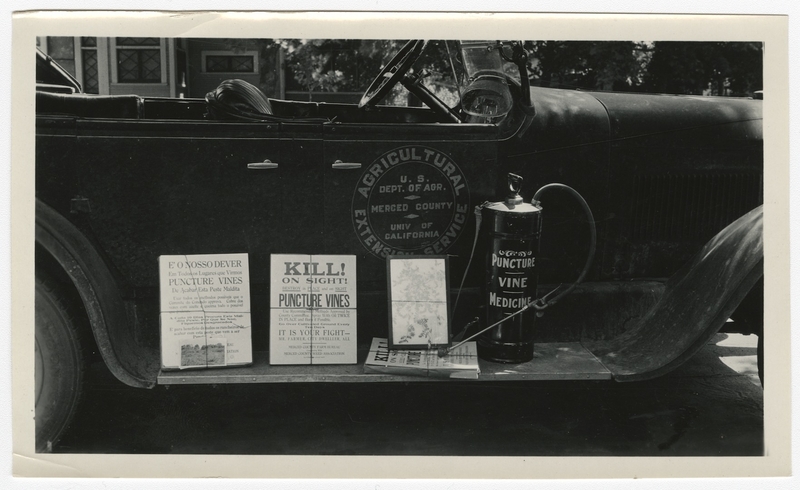 A four-year pilot archive project began after the UCCE centennial in 2014. The Archivist of the United States approved the $308,900 grant from the National Historical Publications and Records Commission for “A Century of Impact: Documenting the Work of the Cooperative Extension in California's Counties.” The three-year project will begin in the summer, after Lin and others hire a group of undergraduate students to help with the work. Additionally, the project will be part of an informational booth at the World Ag Expo in February in Tulare — UC Merced's first appearance at the exposition, which draws more than 100,000 people from all over the world. A pilot project, begun after the 2014 centennial of the UCCE, looked at Merced, Ventura and Humboldt counties' UCCE records, and produced a stack of material 70 linear feet long — just for Merced County. A banker box is about 1 linear foot. Records from Humboldt County included disaster responses from the 1955 and 1964 historic floods, while Merced County's records were mainly about crops, irrigation, the beginnings of the Merced Irrigation District and 4-H. Each county's records provide insight into its unique characteristics, Lin said. The new project will collect 100 years' worth of reports and historic photographs from 20 California counties — in the Valley, along the coast, up north at the edges of the Sierra and along the southern border — and will geocode all the records. Part of the archive collection, a vintage photo of a UCCE Merced County vehicle. “This project is of great potential value in supporting a number of lines of existing research, as well as in opening up new and fruitful areas of inquiry into the interrelated topics of democracy, technology and community,” said David Campbell, a political scientist and the associate dean for social/human sciences in the College of Agricultural and Environmental Sciences at UC Davis. He wrote a letter of support for the project that was included in the application. The digitization project will help researchers at all levels, Professor Mario Sifuentez said. The archives set the stage for many research projects across many disciplines. Historians will find the records helpful, but so will people studying progressive era institutions, immigration, race relations, social movements, technological change or the rich history of food and agriculture in California, Campbell said. There are also implications for political science and public policy scholarship; environmental and climate studies around such topics as water and pesticide use; material for economists and labor market scholars; and geographers. The library is working with the San Joaquin Valley Historical Society, and San Diego State University will also have a set of the records digitized when the project is completed. In addition, regional 4-H students will be part of the project, helping tag and digitize the material. Cornell University Professor Scott Peters, a historian of higher education who wrote a letter of support for the project, said engaging with local students and their families through a 4-H project is particularly valuable. After the 2014 centennial, UC ANR allocated funds to locate a professional archivist at the UC Merced library, which is becoming known for creating comprehensive digital collections of historical materials. Archivist Lisa Vallen began work with the three pilot counties. She found UCCE records in the National Archives as well as pictures, negatives and documents spread throughout the state. The ANR hopes this project will help not only researchers, but will educate the public and policy makers about UCCE. “There's no question about the value of this project and the richness it brings to the whole state, not just UC,” said UC Merced University Librarian Haipeng Li. A professional archivist will begin work in August to document and preserve the history of UC Cooperative Extension. Lisa Vallen, who completed her master's degree in library information science at the University of Illinois Urbana-Champaign in spring 2016, was hired by the UC Merced Library under a memorandum of understanding with UC Agriculture and Natural Resources. Vallen has a range of experience in archives processing and description, physical collections and preservation as well as digitization. “I am pleased to have someone with her energy, initiative and organizational skills in this position,” said Emily Lin, head of digital assets at the UC Merced library. During a one-year pilot project, Vallen will work with UC Cooperative Extension offices in Merced, Ventura and Humboldt counties to conduct an inventory of local resources, assess existing records and select material that has potential historical or research value. Most materials will be digitized and stored on a web platform so they can be accessed by scholars throughout the world. In addition, truly unique documents (such as maps and photos) will be kept in hard copy form. UC ANR vice president emeritus Barbara Allen-Diaz initiated the project following the UCCE Centennial in 2014, when the need to curate and preserve UCCE history became apparent. She chose to work with UC Merced, the newest campus in the UC system, because the school has placed a high emphasis on the development of digital collections, said Jan Corlett, chief of staff to the vice president of UC ANR. The project also furthers the growing relationship with UC Merced established by Allen-Diaz when she placed two UCCE specialists at the Central Valley campus in 2014. UC Cooperative Extension Ventura County academic Rose Hayden-Smith, a historian by training who is on special assignment as editor of the UC Food Observer blog, will work with Vallen on collecting the historical information from Ventura County. UCCE Merced County director emeritus Maxwell Norton will coordinate with Vallen to collect Merced historical information and UCCE Humboldt County director Yana Valachovic will coordinate with her on the Humboldt collection. After the pilot is complete, UC ANR administrators will consider how to go forward on archiving information from other UCCE county offices. UC Cooperative Extension will celebrate its 100th anniversary in 2013. Cooperative Extension was established by an act of Congress - the Smith-Lever Act of 1914. Lawmakers sought to boost agricultural productivity and enhance the lives of rural families by creating a service that channels research advances from college campuses to rural Americans. Anticipating passage of the Smith-Lever Act, Thomas Forsyth Hunt, UC Berkeley’s ag college dean, brought B.H. Crocheron from Maryland in 1913 to organize California’s Cooperative Extension Service. Crocheron hired advisors in Humboldt, San Diego, San Joaquin and Yolo counties in 1913. The centennial will give ANR an opportunity to highlight how it helped make California a leader in the past and how it will continue to assist Californians in solving problems in the future. ANR is now in the very early planning stages for celebrating the occasion and is soliciting thoughts and ideas from ANR members and its fans. If you would like to participate in the planning or contribute ideas for the 100th anniversary celebration, please submit a note at http://ucanr.org/sites/100.